Most of us spend about 90 percent of our time indoors, so the quality of the air we breathe is important. Concerns about health issues, most commonly allergic reactions from inhaling fungal spores, has prompted some homeowners to hire professionals to sample the air in their homes. Air sampling typically involves forcing a known quantity of air through a sampler that pushes the air onto a collection device, typically a Petri dish containing growth medium for fungi. This growth medium allows fungal spores to grow. Other types of samplers collect spores in a trap where they can be counted but will not germinate and grow. A viable air sample collection plate after 10 days. Colonies are counted and expressed as the number of colony-forming units per liter of air impacted onto the plate during collection. All air indoors and outdoors contains fungal spores and small fragments. The outdoor spore concentration varies with the season of the year and climate. In Central New York, where SUNY-ESF is located, the number of spores outdoors drops to low levels from December through February, while the highest outdoor spore concentrations are observed from August through October. There are three main sources of spores found in indoor air. These are outdoor air carried in through doorways and windows; spores carried in on people, pets, or items brought into the home; and fungi that grow and produce spores indoors, usually associated with excess moisture. Musty odor, dampness, water leaks, high humidity and visible mold growth are common indicators that airborne spores are being produced indoors. When analyzing indoor air at a site, air samples are collected both indoors and outdoors. When the relative spore concentration is greater indoors than outdoors, it indicates that the source of spores is not outdoor air, but an indoor source, such as fungal growth associated with a leaky roof, leaky foundation, plumbing leak, or any significant moisture source that is sustained over time. Two sets of results can be generated from the air samples: the total concentration of spores in the sample, and the types of spores in the sample. Concentration of fungal spores in air is usually expressed as “colony-forming units per cubic meter of air” (CFU/m3). The sample collection plate is studied over a period of five to 10 days. The number of colonies that appear are counted and expressed as the number of viable spores in that measure of air. Thus the concentration is a snapshot of the condition of the air in the three to five minutes the sample was collected. Spore concentration can vary considerably with time of day and location in the home, so the amount determined in the sample is simply a measure of the concentration at that time at that location. As activity in the home increases, spores will be disturbed and become airborne. For example, walking across a carpet increases the spore concentration. Stachybotrys sp.A colony of Stachybotryis as viewed with a light microscope. The size, shape and color of the fruiting structures and spores identify microfungi to genus or species. The second set of data from air samples looks more closely at the spores and identifies each of them to a genus or species of fungus. Viable cultures of molds produce spores called “conidia.” The size and shape of the conidia and conidia-bearing structures as viewed with a light microscope can often identify the fungus to its genus or sometimes to its species. The most common genera of mold fungi identified in air samples are Penicillium, Cladosporium, and Aspergillus. Others that are frequently reported include Alternaria, Stachybotrys, Aureobasidium, Chaetomium, Epicoccum, and Ulocladium. Many species of fungi are known to cause allergies. These include Alternaria, and certain species of Penicillium and Aspergillus. What constitutes a significant level of exposure is subject to interpretation. The fungal concentration in CFU/m3 can vary greatly in repeated samples at the same site. Consistent high levels can indicate a problem in the home, as well as high indoor levels of spores relative to outdoor levels. Spores of Aspergillus and Penicillium are the same size and shape, so these are often reported as Penicillium/Aspergillus. The two can be distinguished only if the spore-bearing structures are observed in a culture with a microscope. The genus Penicillium contains about 223 species, while the genus Aspergillus contains 185 species. Identifying the species in either genus is not a simple task and requires considerable time and expertise. While some species are associated with certain illnesses or allergic reactions, others are not. High levels of Penicillium have been linked to the development of asthma in children, although the effect of particular species has not been determined (Gent et al. 2002; Stark et al. 2003; Rosenbaum et al. 2005). Thus, high levels of Penicillium in air samples may not necessarily indicate a problematic condition, as not all species have shown associations with illness. As with Penicillium, the genus Aspergillus contains some species that are known to cause illness, while others do not. Aspergillus fumigatus causes lung infections in people with weakened immune systems, while healthy individuals are not affected. Again, high levels of the genus Aspergillus do not necessarily indicate an exposure risk. 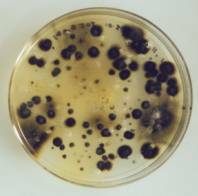 Stachybotrys chartarum (atra) is the black mold that has most been associated with media reports on the toxic effects of fungal exposure. It prefers gypsum wall board as a substrate and requires very high relative humidity levels to grow. Stachybotrys chartarum is known to produce the mycotoxin, satratoxin. Many fungi produce mycotoxins, some of which if ingested can make you ill, such as poisonous mushrooms. The effects of inhaling mycotoxins that occur on mold spores are not known although some scientists claim evidence of neurological damage. There is little if any direct evidence to support this claim, mainly because it is difficult to study these cases of exposure after the fact. Other spore types such as basidiospores, rusts, smuts and others are sometimes reported in commercial air samples. These are non-mold fungi, many of which are commonly found in outdoor air and often reflect outdoor conditions. Basidiospores found inside the home at high levels could be an indication of decayed wood in the home, as many basidiomycete fungi are wood-decay fungi. Recent analysis of homes in Syracuse, N.Y., indicated high levels of basidiomycete fungi in 41 percent of the homes studied (Anagnost et al. 2006). In some homes, 90 percent of the spores recovered were basidiomycetes. This could mean that decaying wood is damaging the structure of the home. Little is known about illness caused by inhalation of basidiospores, although several species have been recovered from infected lung tissues in patients with compromised immune systems. The information provided by commercial air sampling requires careful interpretation because spores are normally found in indoor air. There are no set guidelines about spore concentration levels, other than relative levels indoor to outdoor, and a persistent high level indoors might signal an air quality problem. Another approach to studying indoor air quality is to monitor moisture levels in building materials and humidity levels in the home. Sustained high levels of moisture indicate that conditions are optimal for mold or wood decay to occur. Finding and resolving the source of any excess moisture that is prolonged is probably the most important step you can take to improve the air quality in your home. The four most common genera of molds, Penicillium, Aspergillus, Cladosporium and Alternaria. Anagnost, S.E., Setliff, E.C., Zhou, S. and C.J.K. Wang. 2006. Frequency of Basidiomycete Fungi in the Indoor Air of Urban Homes. Proceedings of the Air and Waste Management Symposium on Indoor Environmental Quality, Durham, North Carolina, July 16-17 2006. Gent, J.F., Ren, P., Belanger, K., Triche, E., Bracken, M.B., Holford, T.R. and B.P. Lederer. 2002. Levels of household mold associated with respiratory symptoms in the first year of life in a cohort at rish for asthma. Environmental Health Perspectives 110(12):A781-A786. Rosenbaum PF; Hargrave TM; Abraham JL; Crawford JA; Hunt A; Liu C; Hall G; Anagnost SE; Catranis C; Fernando AA; Morey SR; Zhou S; Wang CJK; Indoor mold and the risk of wheeze in the first year of life for infants at risk of asthma. American Journal Epidemiology 161(11):134. Stark, P.C., Burge, H.A., Ryan, L.M., Milton, D.K. and D.R. Gold. 2003. American Journal of Respiratory and Critical Care Medicine 168:232-237. Sampling and Analysis of Indoor Microorganisms, 2007, Chin S. Yang and Patricia Heinsohn, Editors. John Wiley and Sons, Hoboken, NJ.